Fifty years after the Little Rock Central High School integration crisis, former JA students reflect on their 'normal' high school experiences. Kaz Oishi's high school memories are crowded with recollections of long bus rides through rural Arkansas and triumphant moments like winning a four-year scholarship on a local television show in the 11th grade. His descriptions of his upbringing in the outskirts of the city of Little Rock paint a picture of an average American working class life - not a footnote in American history. But Kaz is almost inextricably linked to history, mainly because he was there. After his junior year, Kaz's small high school in the city of Scott was closed down because of low enrollment. The next year, Kaz was bussed to Little Rock Central High School; the same year the all-white school was famously forced to integrate. "That was an interesting year," said Kaz, 67, who now lives in Albuquerque, New Mexico. In 1957, Little Rock Central was the epicenter of the civil rights movement when nine black students were denied entrance despite the 1954 U.S. Supreme Court ruling ordering the integration of public schools. The images are indelibly ingrained in history books and the minds of many who lived through that period of racial tension - nine stone-faced students walking amidst armed police officers, the national guards and an angry crowd. 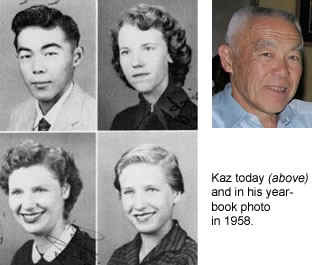 Back then it wasn't just the so-called "Little Rock Nine," there were also three Japanese Americans - brothers Kaz and Tosh Oishi and Frank Nakamura - who were navigating the halls of Little Rock Central during a time of tumult. "I always wondered how they felt," said Elizabeth Eckford about her JA classmates. Eckford, now 66, was one of the "Little Rock Nine" immortalized in photos on Sept. 4, 1957, clutching a notebook and calmly walking away from an angry crowd. She never had any classes with Kaz, Tosh or Frank, but she remembered seeing them. "They were always together," she said. 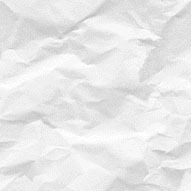 In the crush of bodies in the hallways there was always space around them and when kids gathered in the auditorium, she noticed there were always empty seats next to them. There were only a handful of JA families living in Arkansas between 1957-59, according to Sondra Gordy, an associate professor of history at the University of Central Arkansas. But the state had historically been inhospitable to minorities outside of housing thousand of JAs in the Jerome and Rohwer internment camps. "You have to realize that in World War II, Japanese Americans were far from welcome to our state - and since Homer Adkins was a former Klu Klux Klan member when he served as Arkansas' governor during World War II, he encouraged rigid segregation for the Japanese Americans," said Gordy. During WWII, JAs were not allowed to serve as laborers outside the two camps, forbidden to buy land, go to public schools, or even state colleges. "Very few families remained in Arkansas after they had the opportunity to leave our state," added Gordy. But for the Oishi family, leaving Arkansas after their internment at Gila River, Arizona, wasn't an option. They needed work and joined the Yada and Nakamura families as farmers on the Scott property of Mrs. Alexander Brown. "The presence of these people who were neither white or black created fear that their attendance in schools, colleges, even out in the fields would open the door for blacks to follow the JAs," said Gordy. But when it came time to decide whether the JA kids would go to the white or black schools, Brown stepped up and said the JAs would go to the white schools. 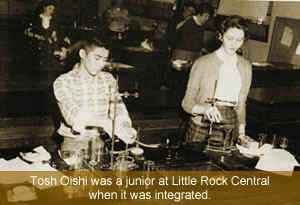 Overall, high school was a positive experience, said Tosh, who was a junior at Little Rock Central when it was integrated. He didn't personally experience or witness any racial problems - at least none that were directed at him. Back then, you were either black or you were white. If you weren't black, then you were accepted as white, said Kaz, who also admitted to sometimes feeling trapped "somewhere in no man's land." 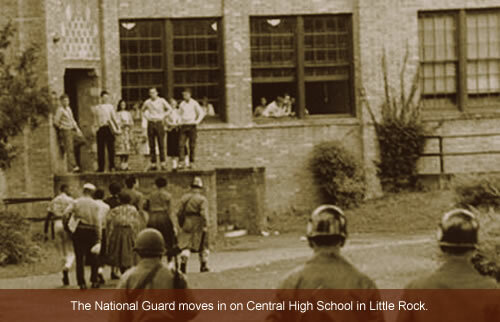 On the day the "Little Rock Nine" was supposed to attend Little Rock Central, Kaz remembers seeing the national guards and later the U.S. Army's 101st Airborne Division surround the building. "Inside the school, the teachers kept control really well," said Kaz. Frank did not feel intimidated or threatened by the troops at all. "It was merely a novel experience seeing the troops at my school though, of course, I understood that they were there to control the crowed of parents who were protesting the desegregation. My view of the student reaction to the black students is that they, on the whole, received [the "Little Rock Nine"] peacefully and some even reached out to them in friendship. There were a few students that were very vocal and demonstrative against the black students being there," said Frank. From 1958-59, Gov. Orval Faubus closed all high schools in Little Rock to avoid further integration, forcing many students including Frank and Tosh to transfer to yet another school. Aside from Frank, Kaz and Tosh, there was Richard Yada, who was a few years younger than the other JAs boys. The integration was a "non-event" for Richard. The year before he was supposed to attend, the doors of Little Rock Central were closed to all students, so Richard was bussed to a high school in North Little Rock. "We talked about it during lunch and between classes," said Yada about the integration. But one year later, the controversial historic moment faded back into people's memories. In his hometown, Yada said he felt more like part of the majority. "I was pretty well accepted in the junior high school." He can only remember one incident, where some classmates taunted him with some racial name-calling, but his peers stepped up to his defense. 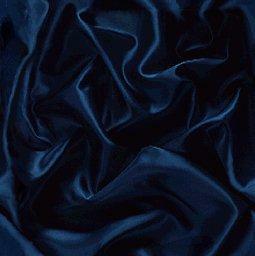 Richard was only three years old when he left his desolate birthplace - Rohwer. As children, camp wasn't such a bad place. He remembers kids felt it was a great place because they played together. "As one looks back on it, you get angry," said Richard, the only one of the original group of JAs who continues to live in Little Rock where he is a certified public accountant with Smith Barney. "They took my parents, made them sell everything, and sent them to a concentration camp where I was born. "Then the U.S. tried to kill my grandparents, who were living in Hiroshima at the time with an atomic bomb," he continued. The U.S. successfully killed a cousin, who was found with her skin peeling off lying on the side of the road. Then during the Vietnam War, Richard joined the Air Force and flew B-52s for the U.S.
"It's all so ironic," he said. He's working on an article about his life in Conway, Arkansas for a September art exhibit. He titled it, "The Day America Stood Still." Life has moved on for all of Little Rock Central's JAs. Tosh recently became a grandfather and Frank keeps busy working for Boeing after serving in the U.S. Air Force. In New Mexico, Kaz enjoys a full life with his family and his work as an engineer with the Sandia National Laboratories. "You have to work for everything you get. Life goes on," said Richard. "I always say that it is amazing that between 1945 and 1957 to 58, the Japanese Americans acceptance by white Arkansans came quite quickly when acceptance of African Americans in the South is still a battle in some segments of society - to this day," said Gordy. c) Pacific Citizen 2008. All Rights Reserved.No portion or content of this website may be reproduced, redistributed or copied without the express written consent of Pacific Citizen.